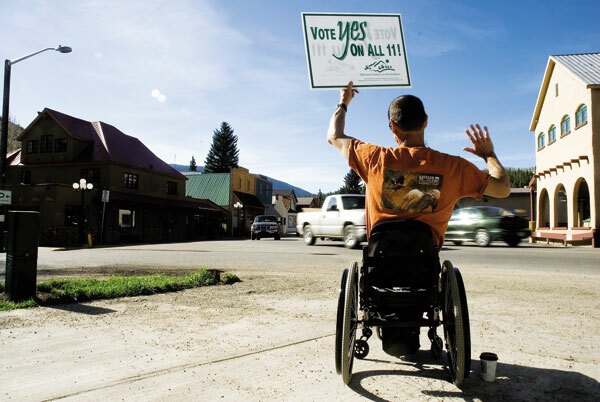 Kristin Anderson/Vail DailyCommunications director for Ginn Co. and Minturn Citizens for Annexation member Cliff Thompson waves as vehicles pass by while he campaigns for a yes vote on Tuesday's ballot in Minturn. MINTURN, Colorado ” Minturn voters went gaga over Ginn Tuesday. Voters overwhelmingly approved annexing land owned by developer Bobby Ginn into the town so he can build a private ski-and-golf resort on Battle Mountain. The vote clears the way for the town and Ginn to continue working out details of the development, which would include 1,700 homes, a private ski area and a golf course.